MANCHESTER City manager Pep Guardiola urges new Spanish president Pedro Sánchez to ‘release the political prisoners’ held in custody following Catalunya’s disputed independence referendum. During a golf tournament for retired football players at PGA Catalunya Resort camp in Caldes de Malavella, the former FC Barcelona star said he believed letting the jailed politicians go free would be ‘the first step’ towards dialogue between the national and regional governments. “Let’s hope the first thing Pedro Sánchez does [in terms of Catalunya] is not to approach the prisoners, but to release the – that’s the most important thing to attempt to start talking and trying to understand each other,” Guardiola said. This should be the starting point, according to the UK Premier League club trainer – for the pro-independence politicians to ‘return home to their people and get on with doing politics’. 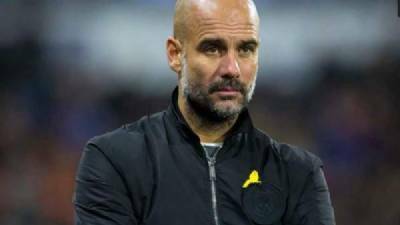 Guardiola, who has been fined €23,000 for wearing a yellow ribbon in support of the ‘political prisoners’ during televised matches, is known to be in favour of Catalunya’s secession. He was also the last name on the candidate list for the separatist party Junts pel Sí (JxSí, or ‘Together for Yes’) in Barcelona in the 2015 local elections.